Recently David Brooks posted a New York Times op-ed lamenting an increase in “bailing,” which he defines as “flaking” on social commitments. The title of the article was “The Golden Age of Bailing,” although I wonder why he didn’t call it “The Bailing Epidemic.” It’s ironic to lament something and at the same time describe it as golden, but let that go for now. Brooks tries to explain people flaking on plans by referencing a list of concerns familiar to many of us. It includes the end of morality, diluted relationships, and “the ruination of all we hold dear” (Brooks’ words). Heavy on the heels of this lament, Brooks shifts blame to smartphones whose apps seduce us into over-booking and then bailing, because both are so easy. A few clicks puts something on our schedule, and a few more clicks takes it off again. Along with being a scapegoat for reckless driving and distracted parenting, the smartphone now is taking blame for commitments we don’t keep. There is another possible explanation for the epidemic of fickle scheduling, and it doesn’t appear on David Brooks’ list. It is the tendency to confuse being busy with being important. Is the glow of a smartphone, a slightly furrowed brow, and a complaint about being “crazy busy” a way of saying we’re very important? David Brooks tries to illustrate the problem of the full calendar with a tongue in cheek example. “The moment of cold reality doesn’t hit” he says “until you look at your calendar and find that you have five different commitments at 4:00 P.M. next Tuesday and not a free evening until 2021.” Brooks is overlooking the possibility that, for some, the even colder moment of reality hits when they look at their calendars and see too much unclaimed time? Do we prefer to be so needed, invited, courted and sought after that we don’t have time for it all? Does a surfeit of requests makes us feel important? After we’ve been to the gym, stopped by the health food store, and walked the dog, if we’re still feeling unimportant we can post something on Facebook or toss off a few more Tweets. Unfortunately, bombarding cyber-space with attempts to be visible doesn’t prove we’re important. Really, who cares? The problem of both the too full and the too empty calendar is the same. Percolating beneath the persona of the busy person and the idle one is the same deep fear. What if the number of people who care if we show up is shockingly small? What if the number of events missed that would really make a difference in the quality of our lives is very few? I’m guessing that even in the golden age of bailing the modern conceit that makes us most uncomfortable is not how important we are; it’s how important we aren’t. That’s what happened since we stopped dropping by to catch up with the neighbors, making phone calls to our friends for no reason at all, and showing up and staying to visit at an open house for somebody’s golden wedding anniversary. Previous articleThe Dryers are Coming! The Dryers are Coming! Interesting. 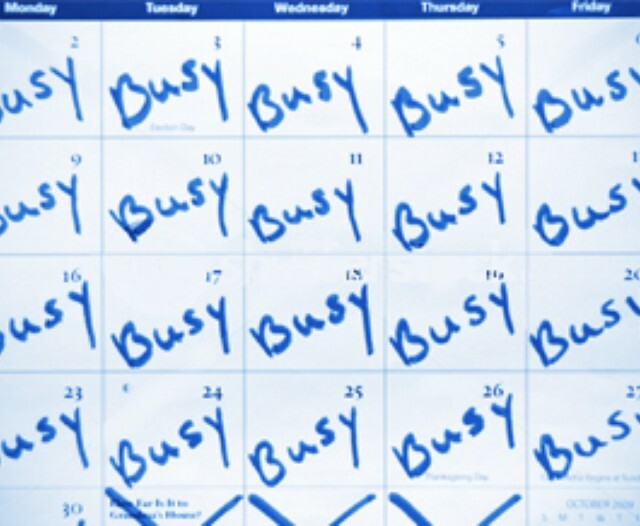 Have we indeed confused activity and busy-ness (i.e. over-full calendars) for importance and productivity? As Image bearers, we’re designed for relationships and (when it comes to our work) productivity. God is relational, works, and is obviously productive, but even He took a day off! As usual, I most often profit from a little perspective. Perhaps moderns and post-moderns could use a little perspective too, but that doesn’t happen very well with frenetic activity. I would submit the idea of Sabbath still obtains! Well, as one of the 12 Southerners wrote, even our leisure time is hurried and frantic. And that was in 1930. Sadly, how right they were!